Summer weather can often have a hugely positive impact on our mood & emotional wellbeing and this year I’m feeling better than I ever have in five years since this journey began. In an effort to capitalise on this fine mood I’m determined to embrace all the joy of the summer months, and that includes new clothes, shoes and bags. Today I’m sharing a review and giveaway on behalf of XY London – who are a fashionable and affordable footwear and bag brand with a really large range of lovely accessories. I’m focusing on shine & sparkle in honour of the good mental health I’m currently blessed with and so I’ve selected so lovely glittery, metalic numbers to share with you. 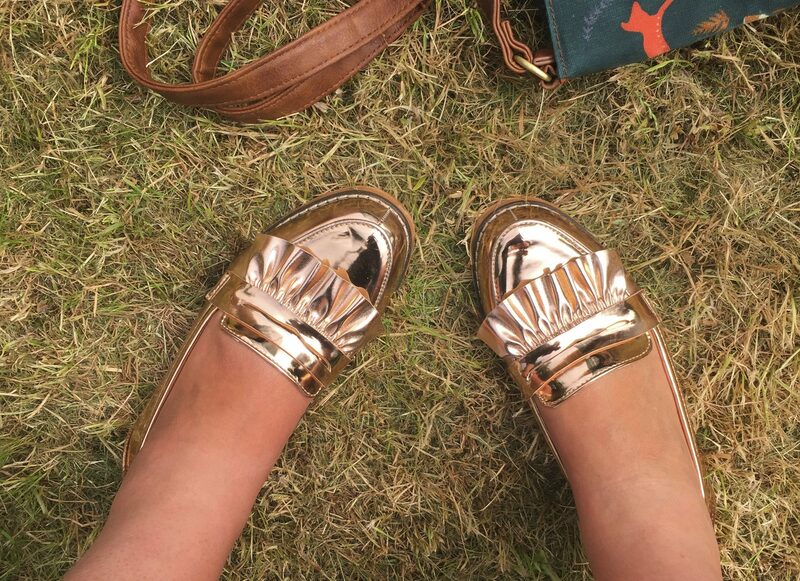 Firstly, I chose these eye-catching rose gold loafers. What I love about these are that they metalic colour injects a bit of glamour into a usually practical style. They are great for dressing up a casual outfit or accentuating other rose gold accessories. I often find loafers quite uncomfortable but these are actually quite comfy once broken in. 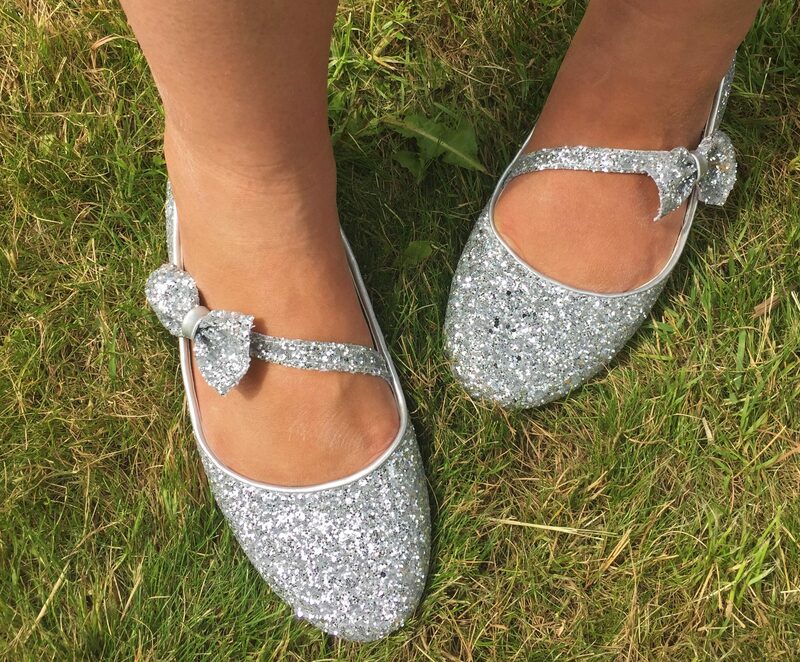 Sticking with fun flats, these silver glitter ballerina bow pumps are absolutely adorable. I’m a huge fan of ballet pumps over heels but I really love when there’s something different or special about them. These are so sparkly and the bow is such a cute touch, they feel really feminine for flats and again are a great way to dress up jeans and t-shirt. Again, they are comfy too. Moving onto sandals I really love these metallic gold wedges. I spend most of my summer in flip flops but I chose these ready for my holidays as a way to switch up an outfit during the evenings. The wedge means you get the more dressed up look without having to stagger around the pool in heels every evening. 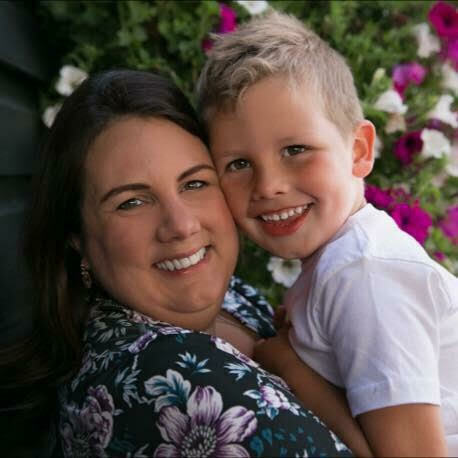 The simple, wide straps give added comfort and security, ideal for when I’m chasing my little man around the dance floor! This final pair is an attempt to step out of my comfort zone (if you’ll excuse the pun). I tend to avoid heels, bar special occasions or nights out, but I was immediately attracted to these beautiful champagne wedge heels. The colour and texture is gorgeous, the stud detail on the ankle straps are a lovely feature and I love the fabric on the toe detail. XY London have a really large collection of footwear to sort all tastes and includes some amazing colours too. They also stock lots of beautiful clutch bags to match any outfit. And the best bit is the affordable price tag! All the above are under £20 and this is reflected across the whole range. Would you like to try XY London for yourself? 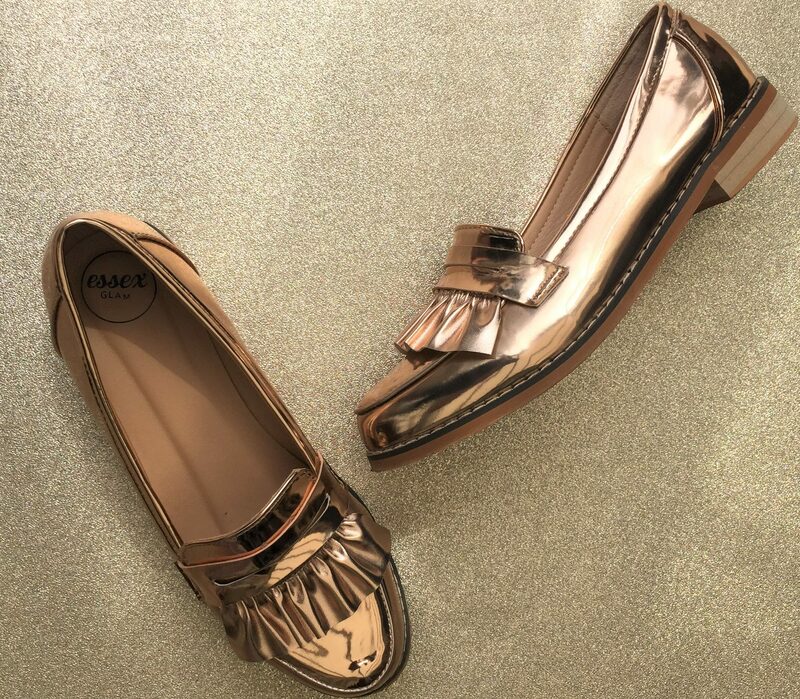 Enter the giveaway below for your chance to win a pair of the rose gold metallic loafers mentioned above. Shop the full selection at www.xylondon.com and receive a 10% discount using the code XYLBM1 from 21st to 31st June. Disclosure: This is a collaborative post. I received the above shoes in exchange for a honest review, words & opinions are all my own. Really stylish and good prices. Many thanks. Loafers and metallics sound like a winning combination to me. Thank you. What a lovely pair of loafers! I would love to win a pair thank you! I would really love a new wardrobe of shoes…. bucket list wish! I love all of the shoes in this post. I love these there so pretty and look so comfortable. Very trendy! I love them, great price too. These would be so comfortable and classy to wear for an evening out. What beautiful shoes – they would look so good for evenings out and trips to the theatre too. These shoes look so comfortable, would love them! Love the look of these shoes, lovely prize! l love the fact they are so stylish and pretty but also look super comfortable!. Great prize and competition. Good luck everyone! 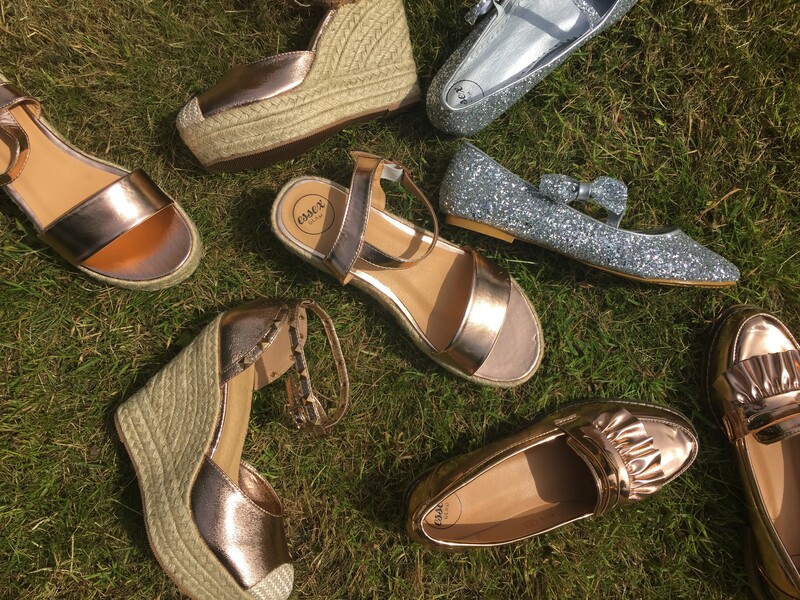 A lively range of fabulous shoes. Perfect for summer.